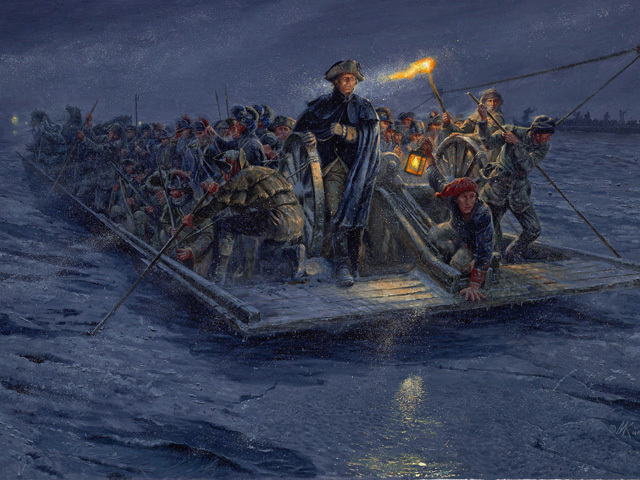 NEW YORK - One of America's most famous images, a painting of George Washington crossing the Delaware River, got much of the story wrong: The American commander wouldn't have stood triumphantly on a rowboat in daylight, but on a ferry bracing himself against a fierce snowstorm on Christmas night. He told The Associated Press that he's "not knocking the original"  the well-known 1851 painting by German-born artist Emanuel Leutze, who Kunstler says "was glorifying Washington using what he knew at the time." But Kunstler said his new piece is aimed at righting the historical mistakes. "I don't see any reason you can't make this scene dramatic and exciting  and historically correct," said Kunstler, an 81-year-old Brooklyn native.